The public protest in the last few weeks is toppling the Egyptian government. The news photos of thousands of Egyptians of different factions fighting over political reform show an explosion of pent up dissatisfaction. 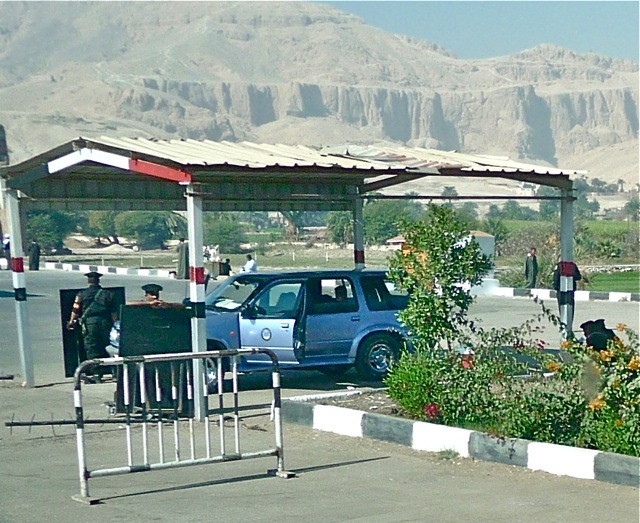 They bring to my mind the several days of escorted tour of this ancient land. 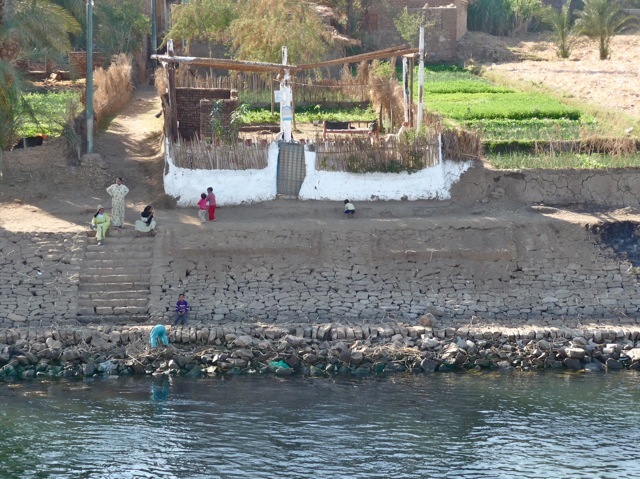 Along the Nile, small and peaceful farms were perfect pictures of an idyllic life. 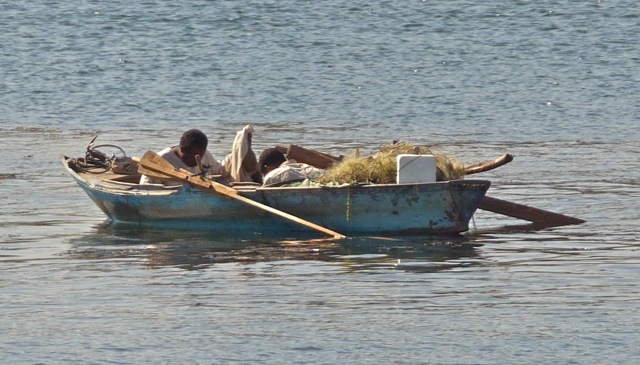 Two fishermen worked intensely to catch the day’s earning. We were not free to roam at our own pace. 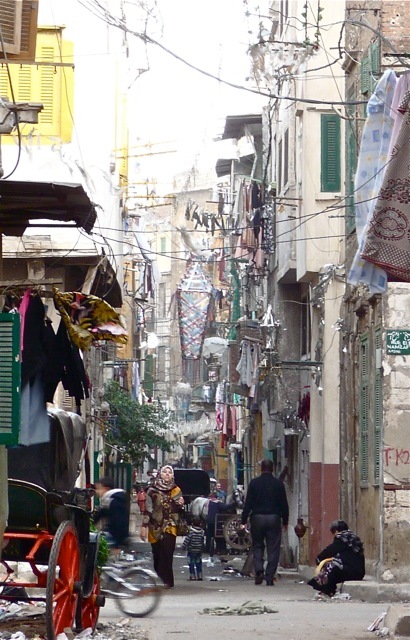 This was one of a few scenes we saw of urban Egypt teaming with everyday life. 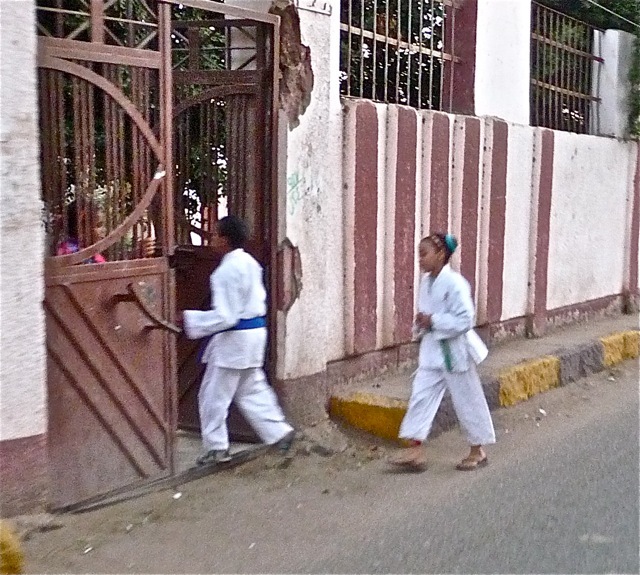 Apartment buildings in Cairo along the highway were less than half occupied. 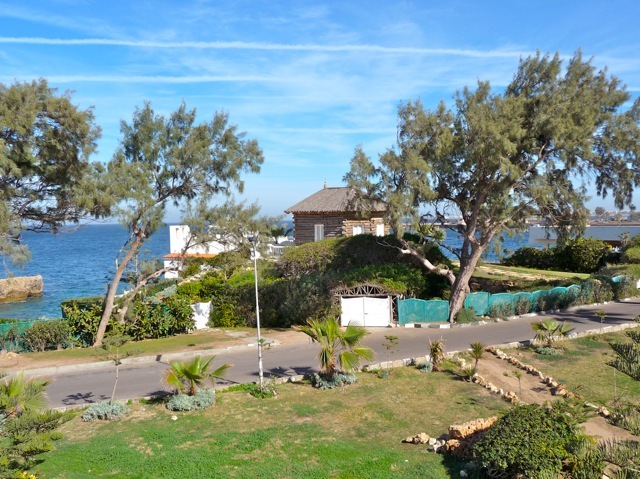 The rich enjoyed a beautiful seaside villa in Alexandria. 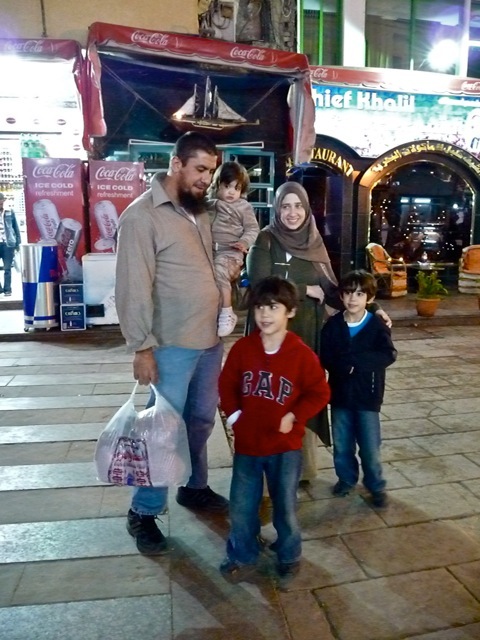 A happy family took a leisurely walk in the market. Women dressed in varying degrees of conservative clothing. Egyptians are civic minded. 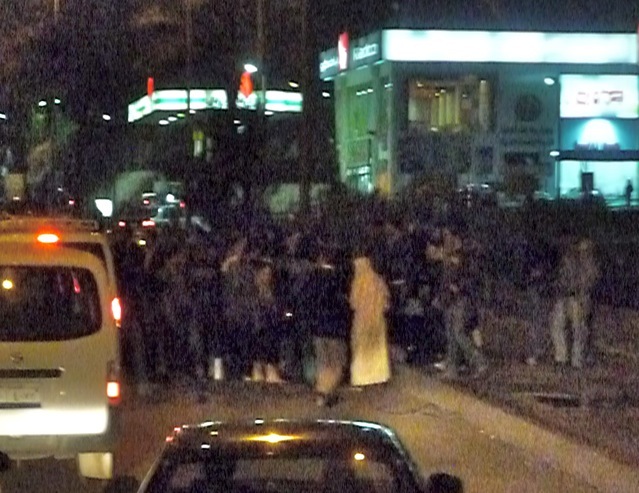 At the scene of a traffic accident, people rushed from all directions to offer assistance. 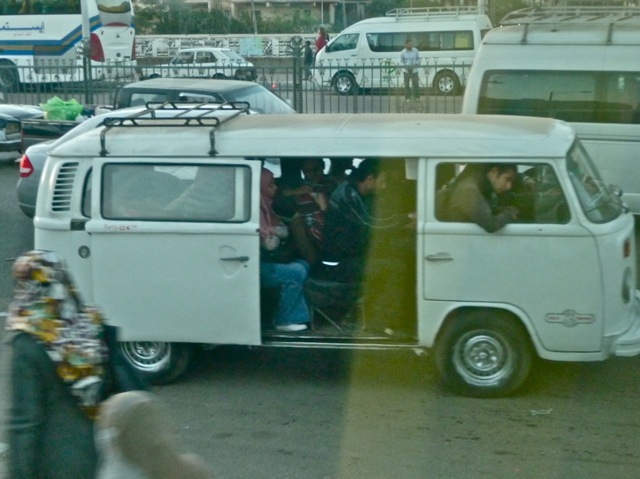 Public transportation facilities were still inadequate, necessitating crowded vans to serve as mini buses. 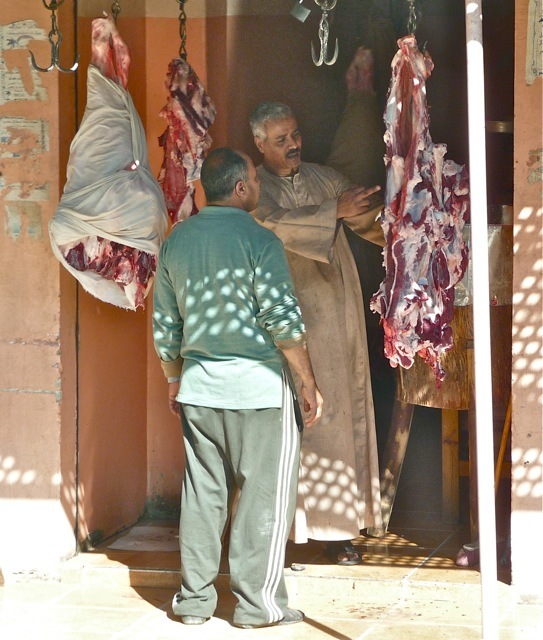 Two men bargain in a butcher shop. 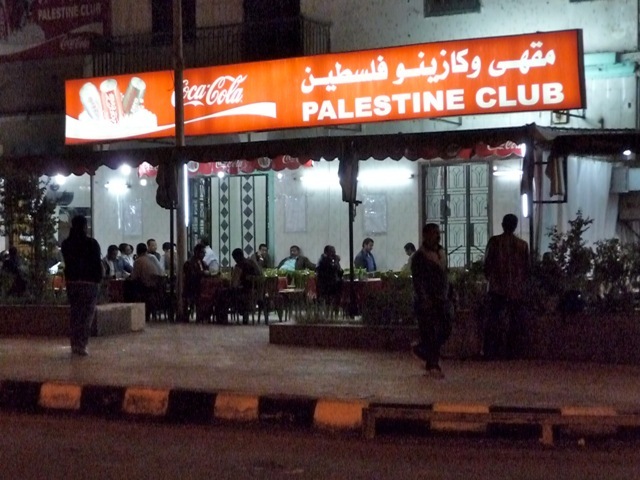 Clear demonstration of partisanship in the Israel-Palestine conflict. 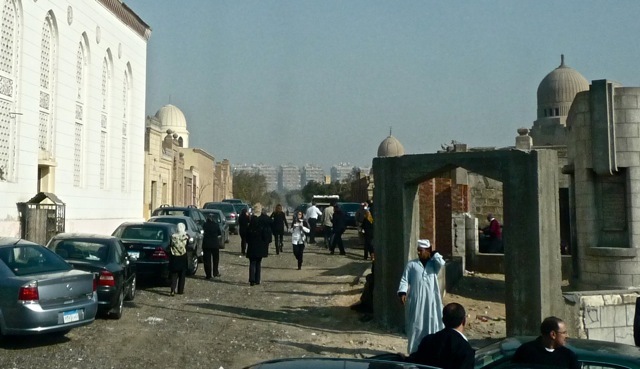 People visit graves at the vast City of the Death in Cairo. Hard times show at empty shops in a mall. 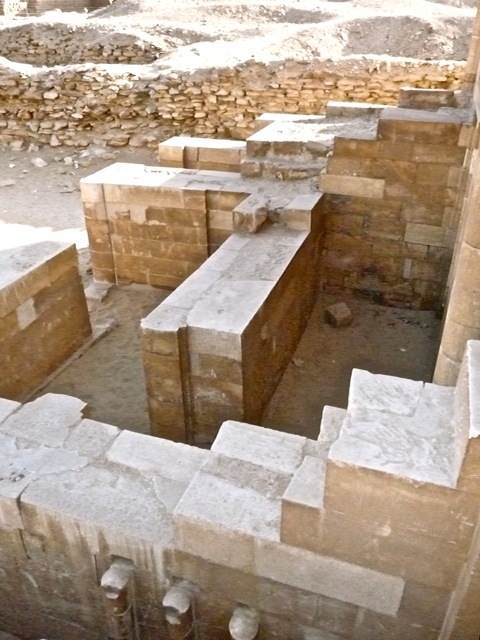 Ancient Egyptian relics were meticulously and beautifully constructed. This precisely built stone wall was constructed 5,000 years ago. 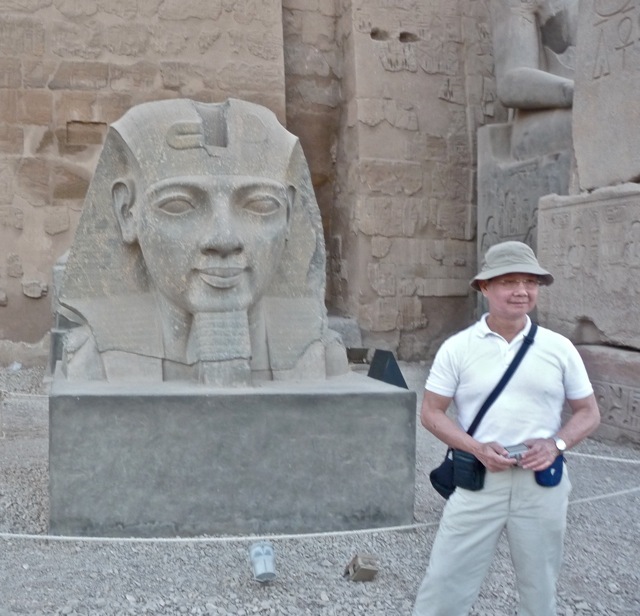 Ramses’ bust was made from very hard granite stone with even harder volcanic rocks. 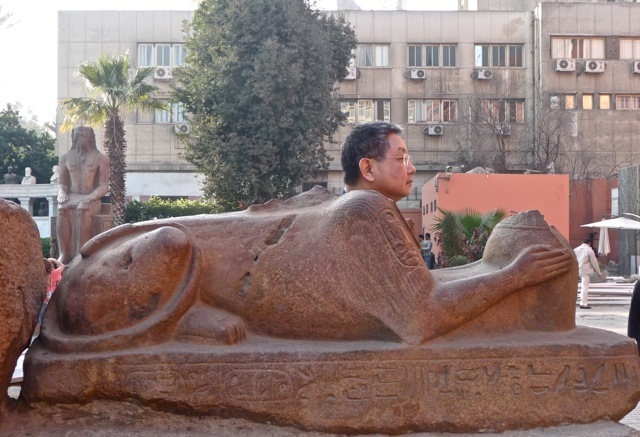 The great achievement of Egyptian sculptures was the fountainhead of subsequent Greek and Roman art. Although I am culturally from another ancient civilization, I feel strong affinity to the Egyptian achievements as a brilliant chapter of human history and should be cherished by everybody on Earth. Police presence was overwhelming. 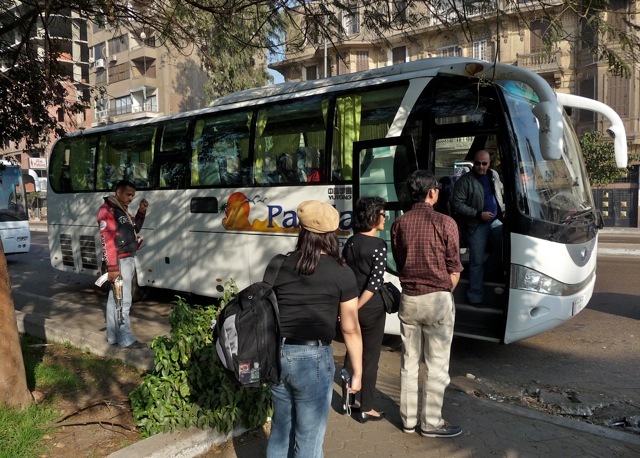 As tourism is a pillar of Egyptian economy, the government puts great emphasis on tourist safety. 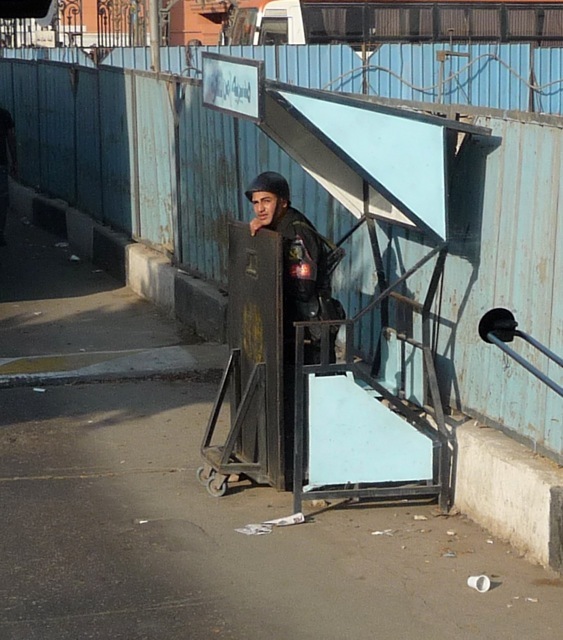 These policemen stood guard behind steel shields against shooters. This police station had guard tower and pill boxes. 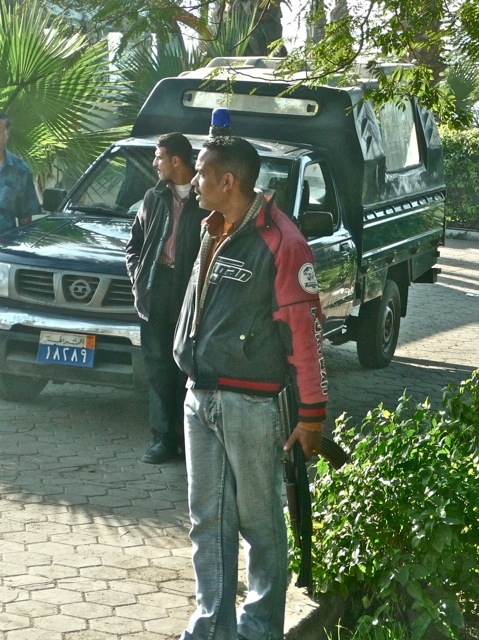 Plain clothes policeman guarded us at the bus stop. All tourists were checked before entering important relics. I saw more AK47 than anywhere else. 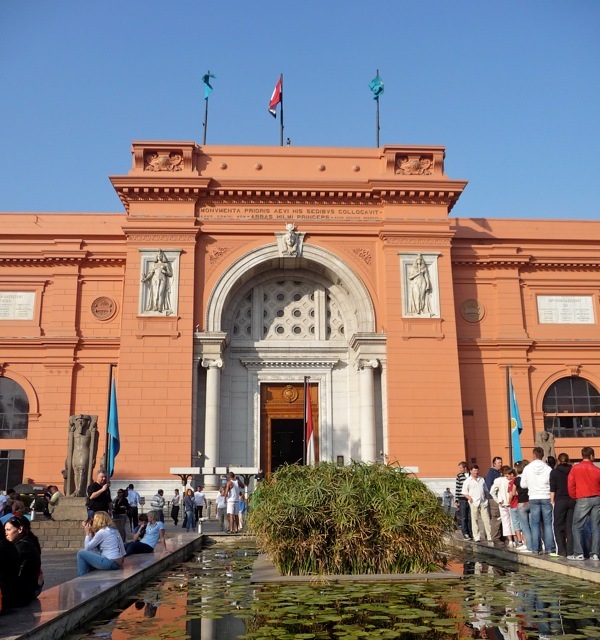 The Cairo Museum, the crown jewel of Egyptian antiquity. 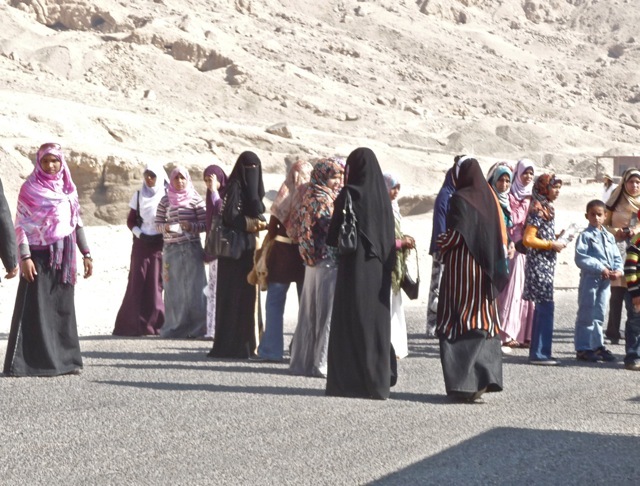 It contains the most important treasures of ancient Egyptian relics and is a must-see for tourists. Cameras have to be checked before entering the Museum. I could still find an interesting prop in the courtyard outside the Museum. The Museum was guarded by a sentry, also behind a steel shield. 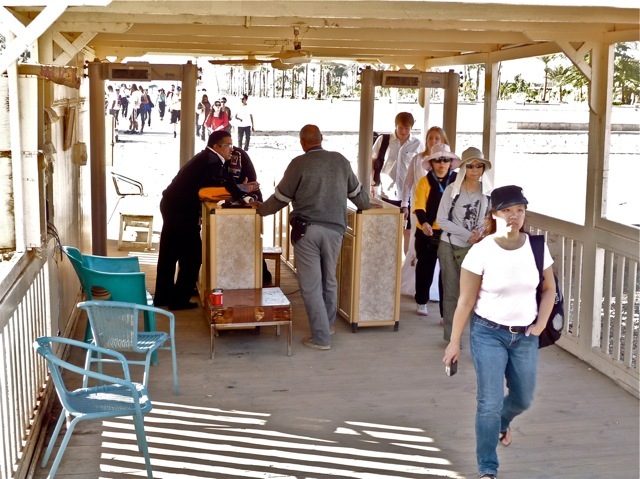 As political upheaval rocked Egypt in the last few weeks, some looters entered the Museum and almost stole some treasures. 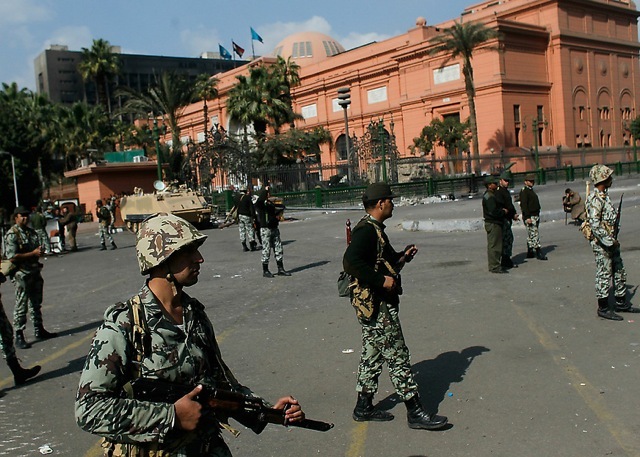 It is now strongly protected by the special forces of the Egyptian army. They are intent on avoiding the wholesale looting and destruction of Mesopotamian antiquities after Iraq was conquered by the American forces. 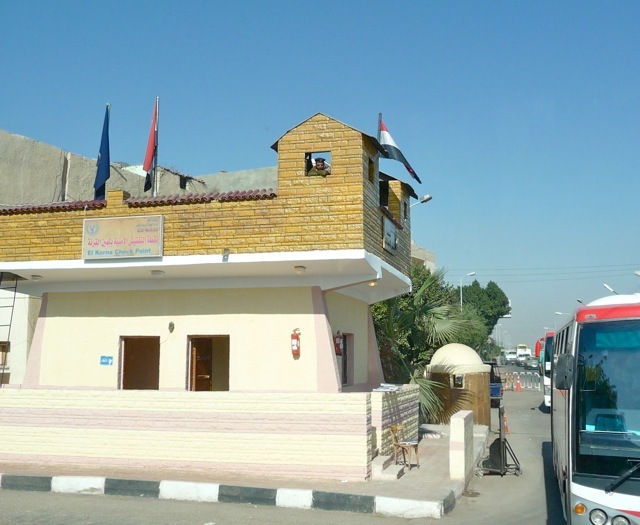 Besides the armed soldiers around the Museum, there are reports of Egyptian civilians armed with sticks guarding the Museum against any looting or destruction of the Museum. 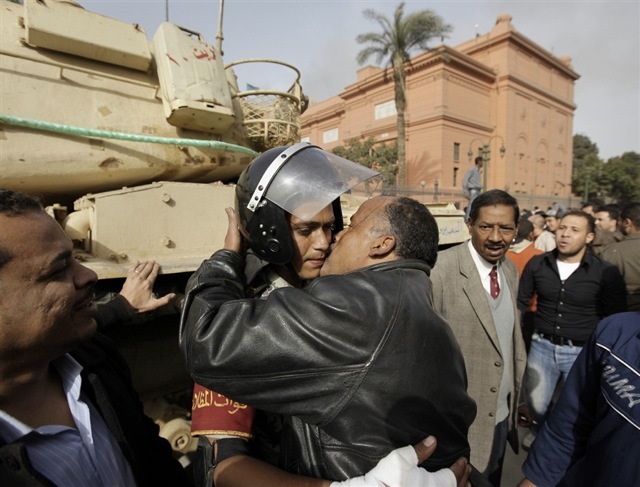 Here, a civilian plants an appreciative kiss on a soldier guarding the Museum. As an ardent admirer of ancient Egyptian achievements and a citizen of the world, I would also like to kiss that soldier. Posted by Robert Wu on Wednesday, February 2, 2011, at 10:29 am. Filed under Uncategorized. Follow any responses to this post with its comments RSS feed. You can post a comment or trackback from your blog.